How to create own website in 2016? There are many ways to get started. But the most flexible solution is building a website with content management system or website builder. Why? 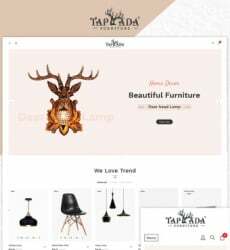 It’s a perfect way for a non-professional to manage a personal site without getting involved in coding and web design issues, using a great number of user-friendly tools for website design customization, social media management, SEO optimization and more. I have tested a few systems. Unfortunately, most of them do not provide their customers with full access to own the website builder in a trial version. Until you try MotoCMS. The company gives full control on the content management system without any charges within 14 days. Thus, you can use the same functionality that you would get by purchasing this product for real. 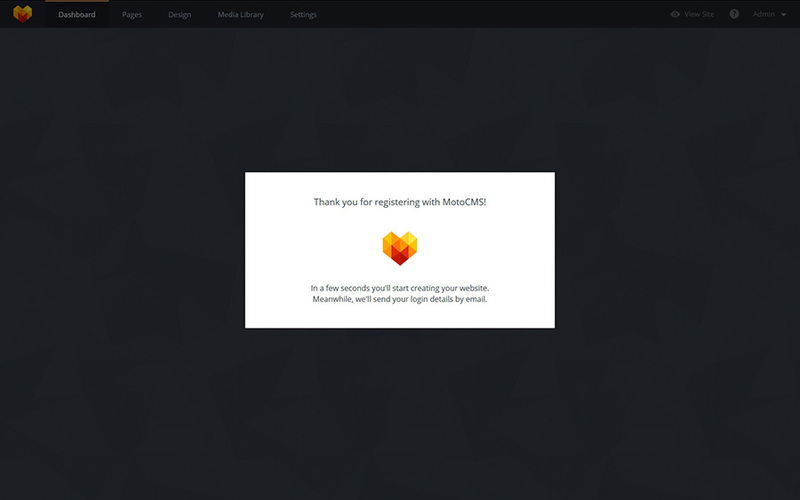 I decided to launch a free trial with MotoCMS and was pretty surprised with the advantages of this system. Drag’n’drop website builders like MotoCMS is a good choice for your website. The company offers zillion of website templates for every business and intent with a built-in admin panel – responsive website builder from MotoCMS. This WYSIWYG editor has a pretty intuitive interface with drag’n’drop functionality, allowing to launch a website within just a few steps. 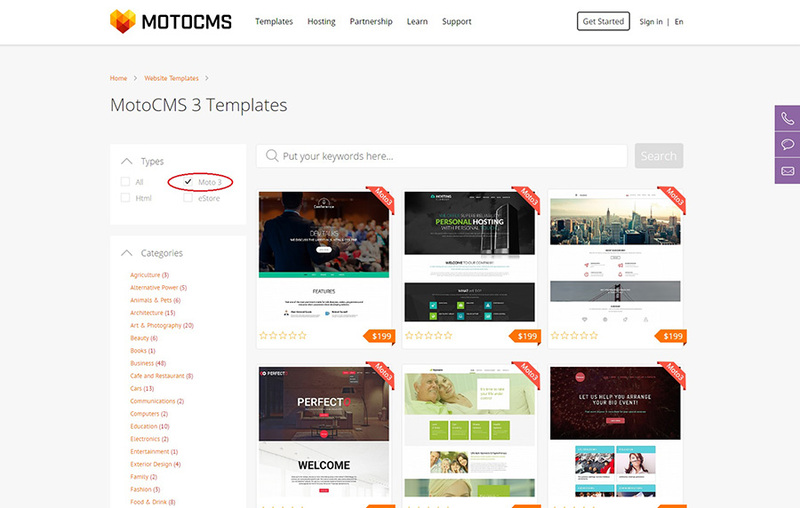 Before purchasing a MotoCMS website, every user can try any website template from the whole collection of 2.500+ professional websites without any charges or fees. So I chose my favorite theme and started my own free trial. To launch free trial period, pick your theme. Please, note that you should check the Moto 3 box to choose the latest version of the MotoCMS admin panel. On the page of your template click on the “Try FREE for 14 Days” button. Sign up with your e-mail or social media account and that’s it! Note that you have an opportunity to continue working with your website even after the end of the trial period. 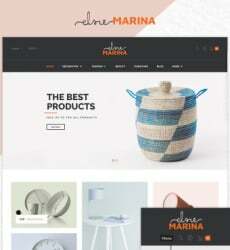 If you like the final result of your website, you can buy the template with all modifications. To do that, click on the button above the dashboard. Working with the admin panel powered by MotoCMS requires no coding skills at all. 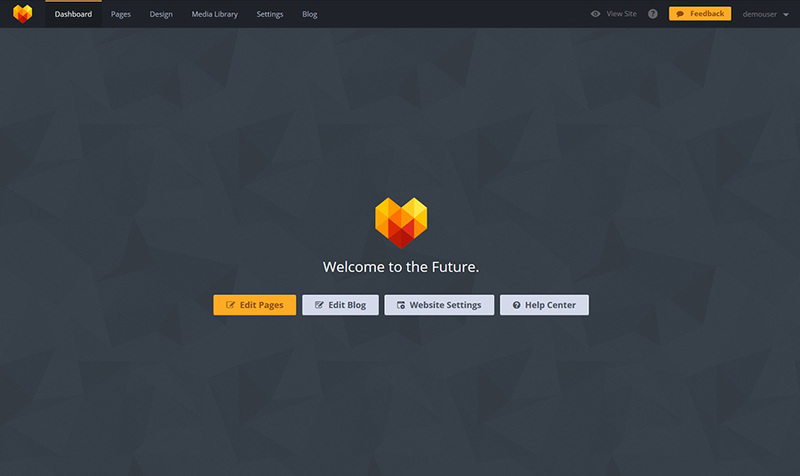 The interface of the website builder is totally user-friendly. Click on the website layout to activate the toolbar. It will appear on the left side of the web builder. There is a rich set of different widgets to provide a user with full website customization. Every MotoCMS website has a specific structure. The layout consists of three major areas: Header, Content and Footer. 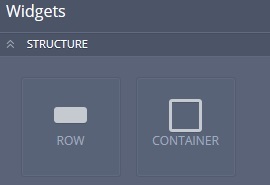 Each of them must have the Container widget. 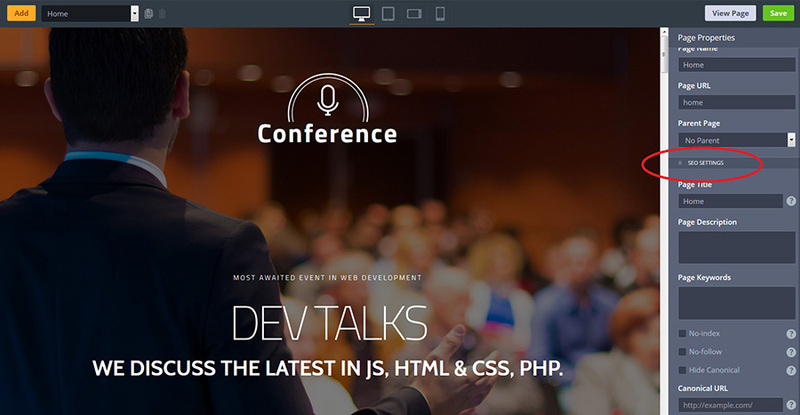 Note that Container is the first widget that should be dropped on the layout. 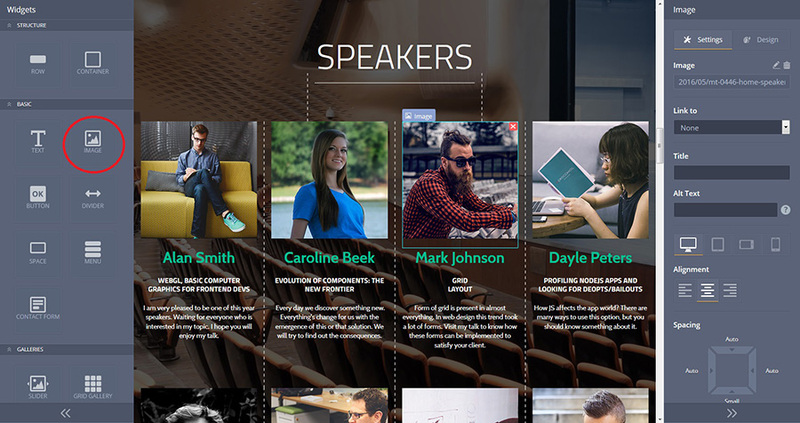 Without Container you won’t be able to customize your website theme. With the Row widget you can divide the layout into two and more parts. Adding text to your website is very simple. Just drag and drop the Text widget on the layout and customize text properties. The admin panel powered by MotoCMS contains a free collection of Google Web Fonts by default. To manage all text fonts, click on the Design section on Dashboard and choose the Text Styles tab. If you need to create an original text style, click on the “Add Text Style” button. To edit your website color palette, click the Design section and choose the Colors tab. Color Picker is a fascinating tool that will help you to manage all colors of your website at one place. There are 5 main colors with 20 additional hues to pick a perfect color tone for this or that website element. The More Colors section is set by default and contains 5 extra tones to customize your website color palette. 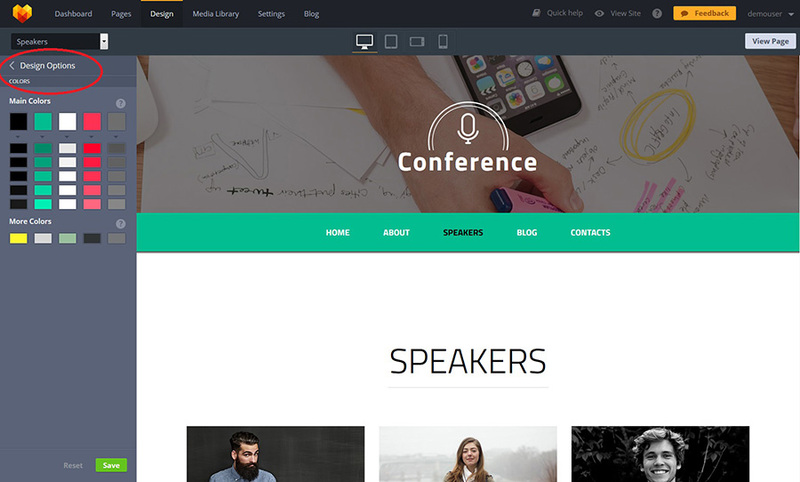 There are also a bunch of widgets that will help you to add media content to your website. The way of adding Image, Video and Audio Player widgets is the same as adding the Text widget. Just drop them of needed layout area. Using the Image widget you can edit its title, alt text, alignment and more. Also, you can set the link, where it goes to. If you need to redesign the Image widget, there are five made-up presets. 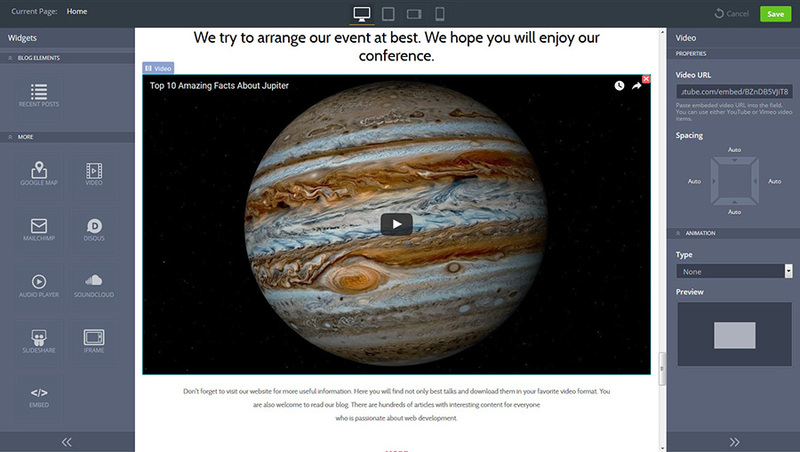 You can also embed the code of any video from popular video hostings like YouTube and Vimeo with the Video widget. If you need to add audio content, there are two widgets in the admin panel: Audio Player and Soundcloud. Upload your .mp3 file to Audio Player or embed track ID/code of any track you want from Soundcloud. Social networks are another significant source of your business online promotion aside from your website. Bind your social media profiles with your website, using social media widgets: social links, social buttons, Facebook Feed, Twitter Timeline and Pinterest Board. Each widget has its own properties that you can edit anytime you need. The admin panel powered by MotoCMS is a SEO-friendly platform. You can optimize each page of your website for search engines. Write unique titles, keywords and descriptions, manage page indexation, add redirects etc. That’s true. You don’t have to learn code. You don’t have to be a web designer. Everything’s simple from the start. 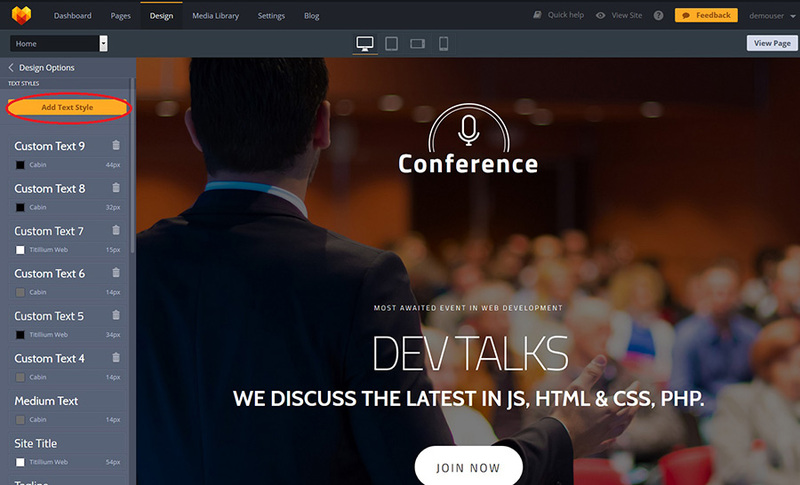 This CMS was developed especially for beginners without any website building experience. The main reason why you should get a website builder from MotoCMS is because they not just give you an opportunity to test their product, but you also get the finished project that you are able to launch as soon as your trial period ends. It’s available for 14 days free of charge. Two weeks are more than enough to learn how the website builder works, as well as to customize a website for own needs. 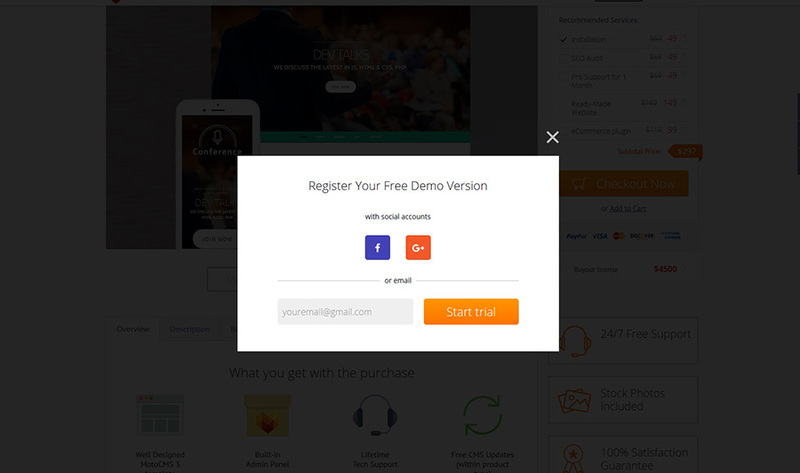 In the end of your trial you can purchase your website with all modifications. In fact, you pay only after you try all features and make sure that this website builder is really what you were looking for. That’s nice. Besides, you launch your site as soon as your trial ends. This saves much of your time. With MotoCMS you can buy an installation service. All you need is to give access to your server and your website will be installed by MotoCMS specialists. The offer is perfect, when you are a beginner like me. Go ahead! 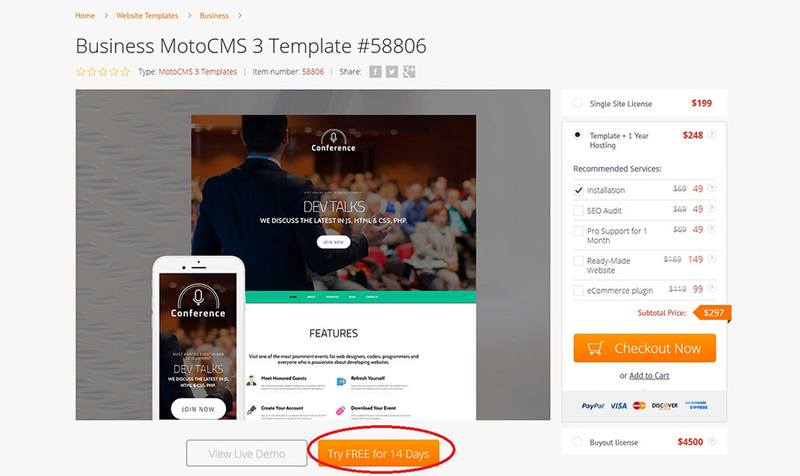 If you are serious about making own website, I strongly recommend you to sign up for the free trial period and try to create a modern website with MotoCMS. In return, you will get a CMS with high level of usability, full time website management and, of course, fast and beautiful website!